The FS2019 ankle bands are here! 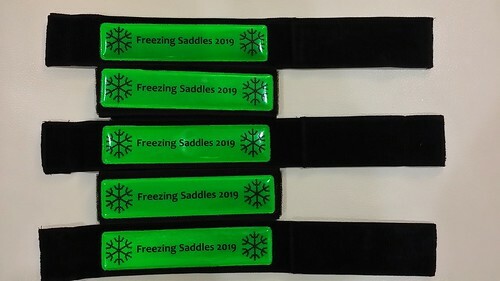 Now you can be certain that the lunatic you saw riding with a joyful smile on his or her face despite the dark/cold/wind/rain/snow/sleet/ice is a fellow FS participant, instead of some other variety of lunatic. The ankle bands are $2 each. They're sturdier than the usual ankle bands, are easily adjustable, and have a hidden pocket for keys or emergency cash. If you'd like to buy them in person, come find me at (1) FCC tomorrow at Swing's, (2) the HP100 this Sunday between 10:00 a.m. and noon, (2) the Del Ray holiday lights ride this Sunday evening, or (4) the kickoff happy hour on Thursday, January 10. After the New Year, I'll usually (although not always) be at my normal coffee clubs: CCCC, HDCC, WTFCC, and FCC. How shall we find you at HP100? If she doesn't visit the forum to respond before Sunday, note that pretty much everyone knows who she is so you could ask around and find out pretty quickly. Look for the short Asian woman in a red rain jacket with green FS zipper pulls. I'll likely be hanging out near the registration or potluck tables from 10:00 a.m. to noon or so. Wait. "Rain jacket?" Is it going to rain this weekend? I will look for you at Hains Point. These look great! Thank you again, komorebi, for doing this. That's awesome! They look great! I want two! Idk if I'll get to HP before noon.... I was planning to get there by 10, but so much less motivated to, uhm, get up and out, with the rain. But I might. I'll look for you if I do. Looks like it should be done raining in time for the holiday lights ride. I might make it to that. I do love those. On our way, will see you at HP.